A little while ago I saw this quote on instagram. I came across it again today in my photostream and it was just the little reminder I needed. Sometimes I'm caught up on life. I tend to work so hard, whether at work or my studies, I forget I'm only so young and that's ok to not have it all figured out by the time I'm 30. I'm truly a thriver, dreamer and overachiever and I have to remind myself that the latter will not become the bigger part of me. In October last year I turned 27 and someone told me around a year ago that 27 is the best year ever. When I look at girlfriends who are my age or younger who are settles and have kids, I'm happy for them but that's just not me. I also have friends who are in their thirties and who are single and childless and are happy as can be. So I've seen uit both ways. Biggest lesson? It's OK to make mistakes, don't beat yourself up over it. Breathe, there's always a new chance to do better next time. It's called tomorrow. Be kind to yourself! 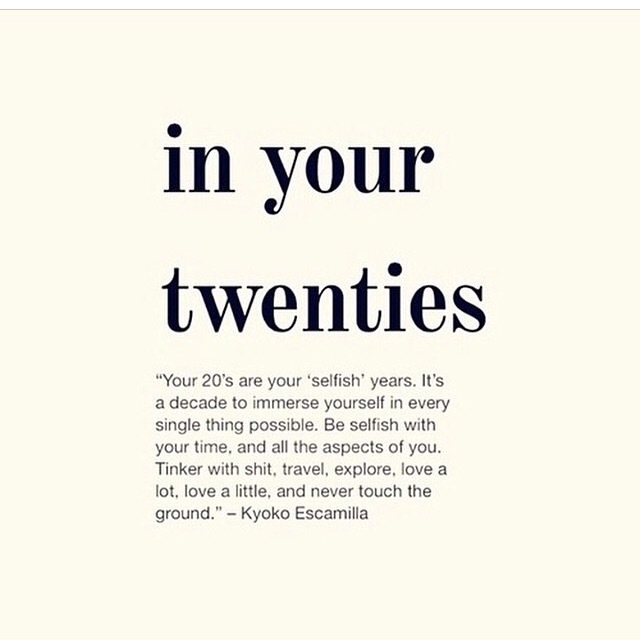 These are my selfish years whether they'll be extended till I'm in my 30's or not, they're now here. And I will unashamedly enjoy them and still feel a bit young from time to time!